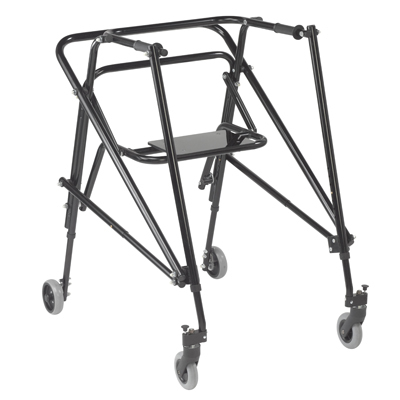 The Nimbo Posterior Walker provides maximum mobility assistance for both adults and children. Choose from five different height settings to experience the perfect customized fit. The Nimbo also features an improved handgrip design for increased comfort, and folds compactly for easy transport and storage. This Nimbo version includes a foldable seat that easily flips down for convenient rest stops, and flips back up to allow continued walking. Available in a sleek black. Inside Hand Grip Width: 17.75"